Please call owner Terri at 804-363-6680. Very well maintained sport fishing/motor yacht. New Enclosed Hard Top on fly bridge. 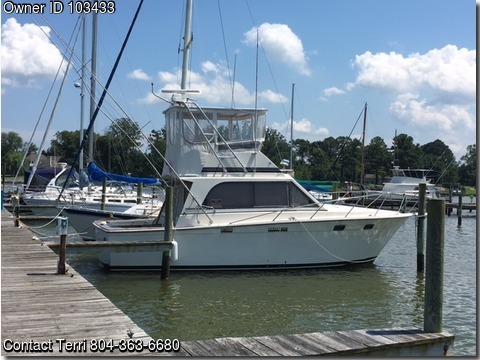 Two A/C units, Generator, 3 Batteries, Hydraulic Steering, Trim Tabs, Water Heater, Full Galley, Stove, Oven, Microwave, Refrigerator, Head w/Shower, Master Stateroom Forward V berth, Sleeps 4+, AM/FM stereo with CD Changer. Two Pedestal Seats, Aft Console Helm Station with all electronic equip, including Depthfinder, GPS, and VHF radio. CO detector, Coast Guard Safety Equipment, Halon in engine compartment, and Anchor. Professionally Maintained, Documented, and Slip Included through Sept 2018.